Having barely recovered from the news that Ernst Jorgensen's long delayed Sun book/CD project will be released in August, I was amazed to learn that one of the four new June FTD titles announced today is an unreleased 1973 rehearsal. 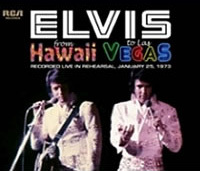 The new 5” digi pack release, From Hawaii To Las Vegas, is an originally recorded cassette recording of Elvis' January 25, 1973 Las Vegas dress rehearsal for his January/February 1973 season at The Las Vegas Hilton. The rough audio quality is more than compensated by the fascinating insight into how Elvis worked in order to create his shows. With little talk, and a lot of music, we are invited to a first row presentation of what he had in mind, and yet he decided to change the repertoire the very next day. Among the many songs is “Separate Ways” - rehearsed with and without the orchestra - a song that Elvis chose to never perform in public. 1) Something 2) You Gave Me A Mountain 3) Steamroller Blues 4) My Way 5) Love Me 6) It's Over 7) Blue Suede Shoes 8) I'm So Lonesome I Could Cry 9) Welcome To My World 10) I'll Remember You 11) Long Tall Sally/Whole Lotta Shakin' Goin' On 12) An American Trilogy 13) A Big Hunk O' Love 14) I'm Leavin' It All Up To You 15) Faded Love 16) I Can't Stop Loving You 17) Separate Ways - with band 18) Separate Ways - with band and orchestra 19) Bridge Over Troubled Water 20) Can't Help Falling In Love - incomplete. Recorded on stage January 25, 1973 at the Las Vegas Hilton. Browsing different Elvis websites it's apparent that fans are thrilled with this upcoming January 1973 rehearsal. So am I. It will be especially interesting to listen to Elvis tackling “Separate Ways,” what a surprise to see that song among all the ones he rehearsed! As for the sound, the Elvis Information Network states, “The one track 'I'm Leavin' It All Up To You' was previously released on the FTD Stage Rehearsal […] The audio quality was pretty good.” And listening to it right now I have to agree (although it's certainly not in the same quality as the songs included on the From Sunset To Las Vegas FTD release, featuring Elvis' rehearsal on August 16, 1974). Whew! First the Sun project and now this unreleased rehearsal out of the blue. Thirty-five years after his death, it's still exciting times to be an Elvis fan. The three other June releases announced from FTD are: the first volume of G.I. Blues in the classic album series, That's The Way It Is on vinyl (stunning looking cover on that one!) and finally the book From Memphis To Hollywood. Indeed, after al these years still exiting audio can be found!!! I Am An Elvis Fan Album – Chosen By The Fans?